Last night I had a great Shabbat meal at a friend's. He's a meat fanatic so all the time he spent in the kitchen prepping was on the main course (or rather, the several main courses because there were so many meat options). 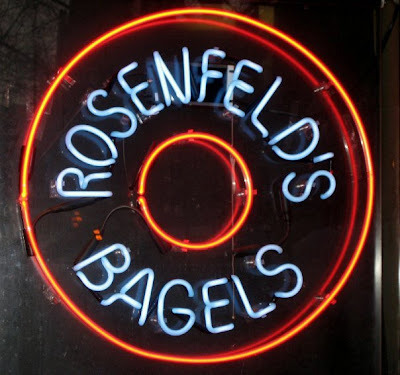 But when we were already stuffed to the brim and rolling in delicious meat gluttony, he cleared the table and presented us with a Rosenfeld's babka. It had been in his freezer since his last trip to Boston. And we made room in our tummies for it. 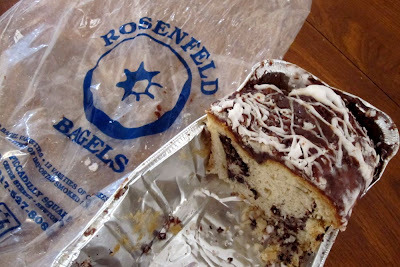 Rosenfeld's is a kosher bagel shop in Newton, Massachusetts, that also happens to make these incredible loaves of chocolate babka. There's a thick layer of chocolate glaze coating the top, plus chocolate filling, and a powdered sugar glaze also drizzled on top. 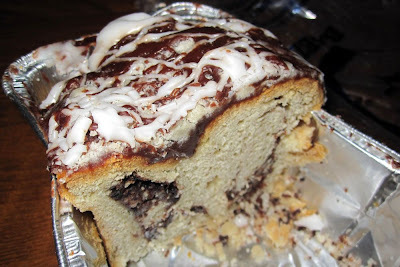 The babka is pareve, making it perfect as the last taste in your mouth after a nice Shabbat meat meal. Best of all, my friend sent the rest of the loaf home with me! 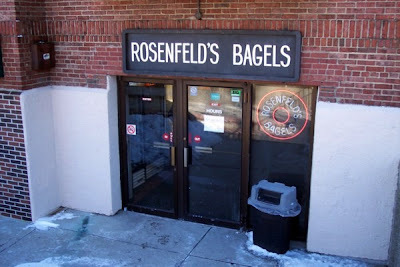 Next time you're in Boston, be sure to visit Rosenfeld's Bagels and pick up a loaf of their babka. It freezes nicely so you can pull it out for special occasions. I hear the challah is out-of-this-world, too. And Yelpers give this bakery a whopping 4.5 out of 5 stars. That's impressive. 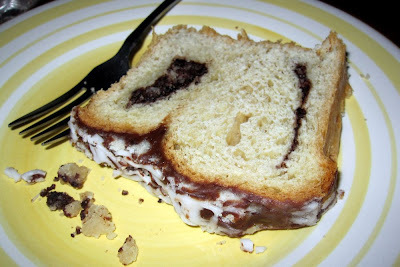 Of course one bite of the babka, and now I see why all the Yelper love. I've been looking for food destinations should I happen to wonder to MA this summer. Great! That looks really good! How lucky for you that you not only got to try it at dinner but you got to take home more for later! Dave - What a lucky duck you'd be to get to go here! I've been told the challah is also out of this world. You'd better make room in your freezer.